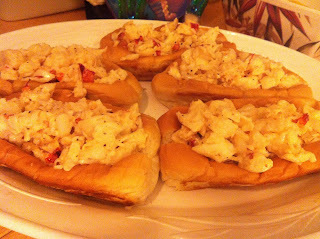 We fell in love with Lobster Rolls while visiting Maine last summer and even did our own Lobster Roll tour. I cannot believe it. I think the people at Sweetbay may have called the insane asylum when they saw me scream and do a little dance when I spotted New England Style Hot Dog Buns at Sweetbay today. They call them Coney Island Hot Dog Rolls. I bought a pack and immediately went to Sanwa where they had Lobster for $5.49 a lb. I grabbed 2 bottles of cheap champagne and let Gabe be a Lobster Killer. I then broke down the lobster in large chunks, added the following ingredients, little at a time: room temp butter, mayo (olive oil based) and salt & pepper. Toasted the bun and voila! The second time around, I used previously frozen lobster tails from Publix, with the same ingredients as above. It cost the same and was just as good, without the stress of driving around with Lobsters in your car, who you have named Curly and Moe, knowing you'd be eating them a few hours later. If you are using Live lobster, You can cook them in straight water. I like using a few bottles of champagne (Rich Lobster! ), some onion, lemon, garlic cloves and seasonings for my water base. Boil them for 12 minutes. If you are using the lobster tails, broil them according to the direction on package from the seafood dept. Chop up the lobster in large chunks, add the mayo and butter to taste, don't use too much. Serve on a toasted bun!